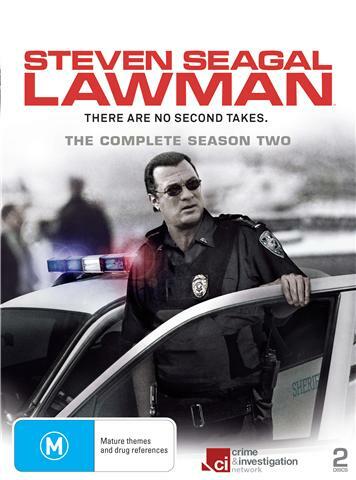 Lawman DVD Review If you have any doubts that Steven Seagal is a total badass, Lawman is all the proof you’ll need. Steven Seagal looks you in the eye. He’s holding a loaded pistol. Across from you are a row of cotton buds that he’s already shot the tips off. Now, without blinking, he stands a match next to them and tells you in that calm, zen-like voice that he’s going to light that match with his next bullet. I dare you to laugh, or smirk, or do anything but stand frozen and watch as he slowly takes aim. The attempt fails, but that’s not the point. There would be few people around with the sheer audacity to try such a feat, much less be serious about it. But this isn’t just anybody, this is Steven Seagal: Martial arts practitioner, action hero, cop. ‘Lawman’ shows us the movie star in a completely different light, on his day job in fact. Far from being an honorary member of the force, Steven Seagal is a real Deputy Sherriff, serving the Jefferson Parish community in Louisiana. Over the run of 12 episodes we follow Seagal and his colleagues in their everyday duties. These include training new recruits in self-defence, building rapport with the community, and of course patrolling the mean streets for signs of trouble. There are a few 911 calls to respond to, but most of the time the action unfolds right in front of them. In one scenario the deputies follow a young man who has just dropped a suspicious package on the ground, probably drugs. They stop him, only to find out he’s carrying a sawn-off shotgun in his pants. The action is all real and spontaneous, leading to some exhilarating and downright dangerous moments. Despite this, you get the feeling that the direction is ever-so-slightly tongue in cheek. Seagal is very aware of his star status, and doesn’t mind playing up to the camera from time to time- the aforementioned bullet and match test being one such example. It gives rise to some surreal moments when the bad guys realise who’s busted them, and proceed to ask for autographs. If you were expecting to see Seagal take on a man with a meat cleaver with only his bare hands, you’d best go and watch Under Siege again. While there are some moments of tension, Seagal maintains his monk-like calmness, preferring to use smooth words rather than force. And that’s fine- who in their right mind would argue with him anyway? There is a whole bunch of extra footage here, showing longer versions of the interviews and scenes that had to be cut short for television. The audio and video quality is shaky, but the content is generally good. When asked about fighting Jean-Claude Van Damme, Seagal shakes his head and says ‘it would be like squashing an ant.’ If you have any doubts that Steven Seagal is a total badass, Lawman is all the proof you’ll need.